Having rebuilt its public face following the Sokovia Accords S.H.I.E.L.D. is faced with a new threat in the form of the Ghost Rider, a killer on a personal vendetta. While Mack and Coulson pursue a lead on Daisy, Fitz discovers Holden Radcliffe’s side project — and May questions where Simmons’ loyalties now lie. "Marvel's Agents of S.H.I.E.L.D." returns with a vengeance for the fourth exciting season in an all-new time period, TUESDAY, SEPTEMBER 20 (10:00-11:00 p.m. EDT), on the ABC Television Network. In the aftermath of their journey to another planet, Director Phil Coulson and the rest of the team were driven more than ever to put an end to the Hydra organization. Little did they know that they were up against the deadliest threat they've ever faced - an extremely powerful Inhuman, Hive, who was transported back from Maveth in the body of their worst enemy, Grant Ward. The team was able to thwart and kill Hive and take down Hydra, but they are all still mourning the death of fellow agent and Inhuman Lincoln Campbell. 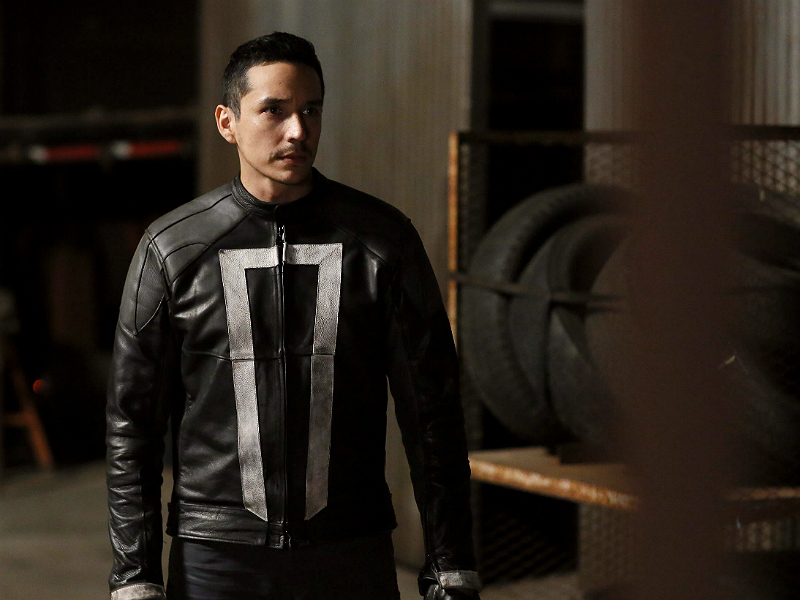 In the season premiere episode, "The Ghost," Ghost Rider is coming, and S.H.I.E.L.D will never be the same. "Marvel's Agents of S.H.I.E.L.D." stars Clark Gregg as Agent Phil Coulson, Ming-Na Wen as Agent Melinda May, Chloe Bennet as Daisy Johnson, Iain De Caestecker as Agent Leo Fitz, Elizabeth Henstridge as Agent Jemma Simmons and Henry Simmons as Agent Alphonso "Mack" MacKenzie. Guest starring are Natalia Cordova-Buckley as Elena "Yo-Yo" Rodriguez, Gabriel Luna as Robbie Reyes, Mallory Jansen as Aida, Lorenzo James Henrie as Gabe, Briana Venskus as Agent Piper, Max Osinski as Agent Red, Ricardo Walker as Agent Prince, Edward Gelhaus as skinhead, Ian Hutton as Blondie, Blaise Miller as lab tech, Samuel Barajas as Felix, Bryan Rasmussen as warehouse manager, Wilson Ramirez as Diego, Jen Kuo Sung as Chen, Jerry Ying as thug #1 and Lilli Birdsell as Lucy.